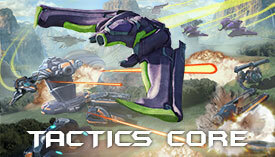 Tactics Core | Play Tactics Core free on iogames.space! Take to the battlefield with a large selection of powerful units which level up and upgrade based on the number of kills you get. Futuristic hover tanks, bombers, and fighter jets. Start as a basic unit like the Javelin (artillery) or the Manta (air fighter). Increase your kill count to unlock more advanced units like the Harpy and Gladiator. Get even more kills to unlock the super units like the enormous flying battleship and the Ion Cannon! Each team starts with a finite number of supply. When you kill an enemy unit, a new enemy unit spawns in its place and the supply ticker for the enemy team goes down. Once the supply reaches 0, all bases defenses explode and the Command Center is vulnerable. Work as a team to destroy the enemy Command Center before the enemy destroys yours! Tactics Core used to be called STBA.io, which stands for "Strike Tactics Battle Arena" and is the official spin-off of the browser RTS, "Strike Tactics." Most units use WASD movement. Aircraft that don't hover, like the Peregrine and bomber, move where you point the cursor. Some units, like the Gladiator, have alternate guns which fire with right-click, but most units just have primary weapons which fire with left-click. Almost all units have at least one ability which is hotkeyed to the number keys. Zoom with the mouse wheel. Try to stay alive as long as possible so you can level up. Switch to more powerful units when you've reached a high enough kill count. Be wary of your Command Center's health by looking at the bars in the top middle of the screen. If your team's supply becomes depleted, get back to your Command Center to defend it! Needs more attention people need to spread the word about a free game like this. It has major potential and with time, updates and lots of commitment and time by a group of people it could definitely become a game worth money even if it's only a little. This could be like an ultimate version or something. though i like it free and to much stuff may ruin the game or ruin its wonderful charm. This can be a discussion for possible ideas, development, bugs, updates, complaints and, sometimes opinions. I think having multiplayer games should be easier like updating team matching and, being in the same room or even in a party? Multiplayer should also have more features alongside just general multiplayer interface and mechanic updates. I don't want to be demanding and i also don't want people to update this if they don't normally or if they do not want to because it is fine by itself. who else thinks this comment system looks like steams?